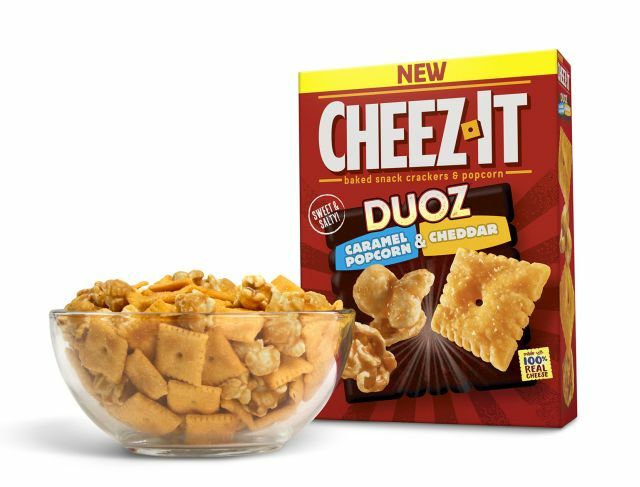 Cheez-It's latest Duoz flavors combine the brand's trademark cheesy crackers with caramel popcorn and sharp cheddar pretzels. Specifically, cheddar Cheez-It crackers are paired with caramel popcorn in one variety for a sweet and salty combination while cheddar jack Cheez-It crackers are featured alongside sharp cheddar pretzels for an extra cheesy flavor. You can find the two new Cheez-It Duoz at retailers nationwide.